Distinguishing Characteristics Hispanic female. Black hair, brown eyes. Saucedo has a surgical scar on her abdomen. She may use the last name Morales. 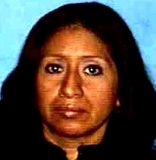 Saucedo was last seen at her home in Riverside, California, in the morning before leaving for her dry-cleaning job on February 11, 2011. She has never been heard from again. She lived in the 4200 block of Hale Street at the time of her disappearance, and rented rooms to two male boarders. Although she had mentioned the possibility of going to Las Vegas, she didn't say she meant to leave anytime soon, and it's uncharacteristic of her to leave without warning. Her purse, clothes and makeup bag were in her room, which was left in disarray. Saucedo's 20-year-old nephew, Adolfo Jose Morales Barahona, had been staying with her rent-free in the weeks prior to her disappearance. When the other men who lived with her asked where she was, he said she'd gone to Guatemala. However, Saucedo left behind her passport, driver's license and credit cards, making it unlikely that she could have left the country. Her nephew told them she had authorized him to collect their rent payments on her behalf, but Saucedo's roommates refused to give him any money. Her boarders reported her missing on March 4. A photo of Morales Barahona is posted with this case summary. The weekend after his aunt's disappearance, he drove her car, a tan 2001 Honda Accord with the California license plate number 4TJZ205, to Bakersfield, California to meet a 17-year-old girl he'd been corresponding with online. Although he was unemployed, he was carrying at least $3,000 in cash. He bought the girl a new cellular phone, gave her money and got a new speaker system for Saucedo's car. In Bakersfield, Morales Barahona checked into a hotel under an assumed name, paying cash for everything. Morales Barahona dropped out of sight within a few weeks of Saucedo's disappearance. A few months later, he was arrested and charged with first-degree murder in her case. Saucedo kept large amounts of cash stored in various places around her house, and investigators believe her nephew killed her after she interrupted him robbing her home. At his trial in the fall of 2012, his defense argued there was no physical evidence to prove Saucedo was dead, and said the reason Morales Barahona had so much cash after her disappearance was because he'd been selling drugs. He was convicted in October 2012, after the jury had deliberated only ninety minutes. He was sentenced to life in prison. Saucedo's body has never been found. Updated 3 times since October 12, 2004. Last updated April 24, 2014; details of disappearance updated.